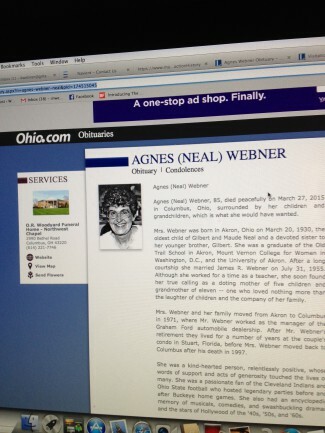 Here’s the latest work of the Webner family obit writer: Mom’s obituary, which was published today in the Columbus Dispatch and in the Akron Beacon Journal, Mom’s old hometown newspaper. Mom hasn’t lived in Akron for 40 years, but we know she still has good friends there who would want to know about her passing. The on-line versions of the obits appear on legacy.com, which must be a kind of national clearinghouse for obituaries. The website versions of Mom’s obit also include links to an on-line “guest book” where people can give their condolences and share their memories, and directions to the funeral home where we will be having calling hours later this week. The website also offers a link to ancestry.com and information about how many Webners were recorded in the 1920 census and fought on the Union side in the Civil War. Other links provide information on funeral etiquette, such as helpful advice that you shouldn’t wear flip flops or glittery clothing to a memorial service. It all shows how news websites are far more flexible — and provide far more advertising opportunities — than print newspapers. People die, but the wheels of internet commerce roll ever onward. Our family would like to thank everyone who has shared words of encouragement and support and kind thoughts about Mom. They are all much appreciated. I’m happy to report that our nephew Andrew Kishman and his church, the Miller Avenue United Church of Christ, have made the news — and in a good way, too. Andrew is all about community outreach, and his passion and approach to his ministry were featured in the pages of the Akron Beacon Journal. I hope Andrew’s zeal help to reenergize his church and help its neighbors. I wasn’t going to write about this, because I viewed it as a wonderful personal gesture made out of friendship and decency, not something done for any kind of publicity. However, Marla Ridenour of the Akron Beacon Journal has written about it, so I thought I’d add my two cents’ worth. On Saturday, we had a celebration service for Aunt Bebe. To our surprise and delight, former Ohio State football coach Jim Tressel was there. He had established a correspondents’ relationship with Aunt Bebe, as Ridenour describes, and he also visited Aunt Bebe in her final days. He wanted to pay his respects and share some thoughts about her. What’s more, Coach Tressel was there even though he was squeezing his visit between an important morning meeting for the University of Akron, where he currently works, and an equally significant impending family obligation. Many people — even those who aren’t famous — would have begged off without a second thought. Not Coach Tressel! It was a kind and classy gesture by a kind and classy man. We in Aunt Bebe’s family appreciated it, not only because it help to celebrate a loved one’s life but also because it showed there are still good people in the world. It helps to be reminded of that from time to time. Jim Tressel is one of those good people. Thank you, Coach Tressel, for your thoughtfulness and kind gesture!